We accept cadavers for post-mortem examinations from small animals including dogs, cats, rabbits and rodents to large animals including farm, zoo and equine, as well as birds, reptiles, fish and other small exotic species. For a printable map showing detailed delivery directions, please click here. All post-mortem cases will be examined by our board certified pathologists. As a teaching institution, private post-mortem submissions are used to facilitate teaching our final year veterinary students on their pathology rotation. As such, the animal may be kept frozen until it is of maximum educational benefit and the turnaround time for receipt of the final report may be up to 6-8 weeks. Please communicate this to the client before submitting for examination. For urgent cases (for example, if other animals may be affected), please phone to discuss. 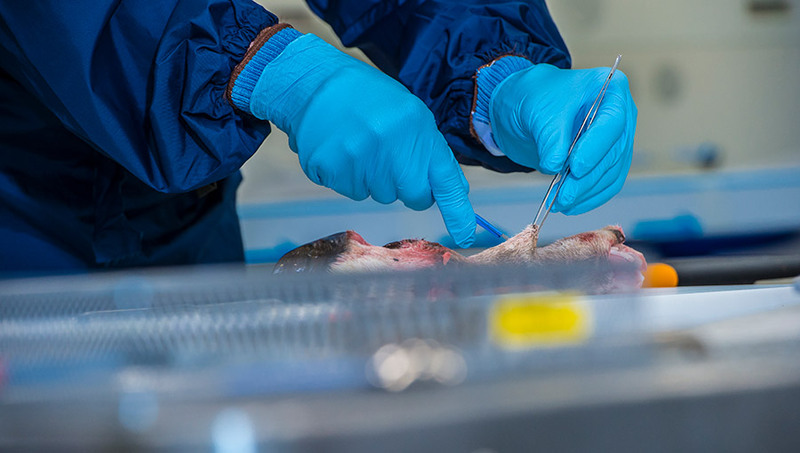 Gross post-mortem examination and routine histopathology for up to 5 tissues will be included in the standard fees which are based on species and weight as shown in our post-mortem price structure. Additional tests recommended in the initial report will be charged only following approval by the submitting veterinary surgeon. Our standard pricing for post-mortem examinations can be found here. We accept cadavers for post-mortem examination from small animals including dogs, cats, rabbits and rodents as well as birds, reptiles, fish and other small exotic species. Our purpose-built facilities also enable us to accept large animal species including farm, zoo and equine. Advance notification will be required for any intended post-mortem submission so that we can coordinate delivery and properly manage logistics. All cases must be accompanied by a completed signed submission form. Disposal will be by either individual or communal cremation. We cannot return animals for burial after post-mortem examination and we do not carry out cosmetic post-mortem examinations. Routine disposal of cadavers is by communal cremation and the cost is based on the actual weight of the cadaver in kilograms. Prior to post-mortem examination animals will be weighed to give a specific final price charged. Disposal costs are shown here. If an individual cremation is requested we can suggest a local pet cremation service. We have inspected this provider ourselves and have confidence in their professional standards. Individual cremations are charged depending on species, weight and specific requirements for return of ashes. Any individual cremation will need to be arranged directly with the provider and will be subject to additional fees payable directly to the pet cremation provider. Please indicate this as a request on the Submission Form. We will liaise with the pet cremation provider regarding transfer of the cadaver. For further details on the submission process please see our guidelines here.